Members of the 50th Infantry Brigade Combat Team travelling in a convoy through southern Iraq on their way to Basra International Airport. Credit: Joe Amditis (2009). First, there’s the underlying premise of Yung’s argument, which is that the American public “almost universally” trusts and respects the military. Yung bases this on a nearly seven-year-old study from the Pew Research Center that found Americans generally trust the military — with some important caveats. More recent polling data actually shows that people from 65 different countries view the U.S. government and its military as the biggest threat to world peace, or they view the United States as a major threat to the safety of their country. 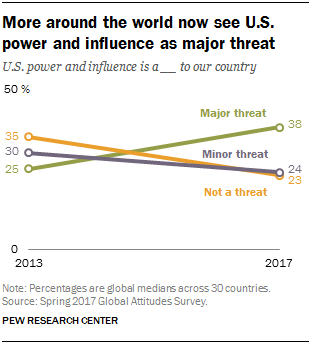 “Globally, more people see U.S. power and influence as a major threat.” Pew Research Center (2017). The very next sentence, however, qualifies that favorable view by pointing out that more than 70 percent of those same respondents “know little about the realities of military service.” The next paragraph reiterates that the overwhelming majority of Americans “have little or no understanding of the problems faced by those in the military,” aside from the general sense that people in the military and their families have had to make sacrifices and carry greater burdens than the average American. The study also notes that they’re pretty much fine with that. Still, there is an important distinction to be made here, one which Yung conveniently avoids: Support for the people who serve in the military does not necessarily equate to support for the military as an institution. They are related and sometimes overlap, but they are ultimately distinct. Yung fails to address this distinction and, in doing so, he conflates respect for military service with respect for the foreign policy decisions of the military and its leaders. That’s basically what Yung’s article boils down to: a poorly-written and barely sourced reminder for all of us to Support the Troops™. Yung offers no concrete solutions or reasonable suggestions as to how the media might improve its relationship with the general public. It’s mostly just military festishism and blatant propaganda — and it’s not even good propaganda. 1. The military promotes values like honesty, accountability, and self-sacrifice. 2. Popular culture shows the military in positive light. 3. Military people don’t brag — they act. 4. The military learns from its mistakes. The reality is that the military takes accountability seriously when it serves the interests of the military. The same can be said for most institutions, both public and private — including the media. But you don’t have to be Noam Chomsky to recognize the level of willful ignorance required for Yung to make the larger argument stated above. Whether legal, moral, or otherwise, accountability has never been the U.S. government’s strong suit. It took the U.S. government 40 years to sign the Genocide Convention, just one year before North Korea, in part because it wanted to avoid any actual accountability or prosecution for it’s own actions by the International Criminal Court. In my lifetime, the U.S. military and various U.S. intelligence services have engaged in torture, kidnapping, extrajudicial killings and assassinations (including a U.S. citizen and two of his children), violent regime change, the use of banned munitions, and multiple wars of aggression. We are still detaining people inside the legal and moral black hole that is the Guantanamo Bay military prison in Cuba — including those who have long since been cleared for release and those who were never charged or convicted of a crime. The only people who were held accountable for the torture and sexual humiliation of detainees at Abu Ghraib prison were the low-level soldiers who directly participated in the torture. Zero legal or moral accountability for the people who wrote the policies that encouraged the abuse. Bush, Cheney and Rumsfeld all got book deals. Bush has even started to make a more full-throated comeback in recent years. The United States is also currently bombing or conducting operations in at least eight different countries (and still occupying two of them), supporting a genocidal campaign by Saudi Arabia against the Houthis in Yemen, and maintains a constant military presence inside scores of sovereign nations around the globe — all while taking in a depressingly small number of refugees attempting to escape the death and destruction left in our wake. The U.S. government also provides military support to at least 73 percent of the world’s dictatorships. There are 17-year-olds signing up for military service today, as I did when I was that age, who have never been alive during a time when the U.S. was not at war. A photo of me (back) and one of my battle buddies during pre-deployment mobilization training in 2008. 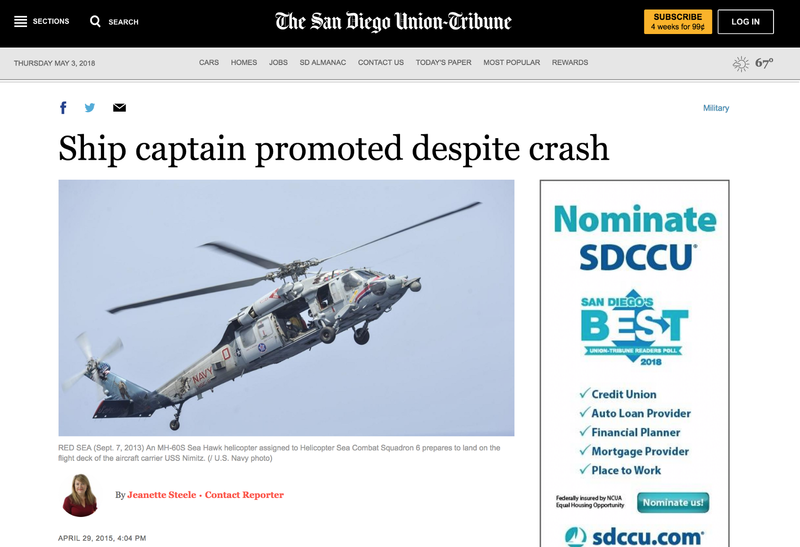 Where is the individual or institutional accountability for the wide range of humanitarian disasters to which our military has contributed over the years? Yung’s second argument can be summarized as such: The military is portrayed positively in the media because they are a massive, opaque organization that restricts public access to information and leverages its vast financial and political capital in order to cultivate a positive public image. “Hollywood,” Yung writes, “is where where most Americans get their understanding of the military.” This may very well be true. Fortunately, Yung included two links in his second paragraph. Unfortunately, those links do not take the reader to an old Pew study or even a news article. They take you to the IMDB listings for Top Gun and Zero Dark Thirty, respectively — that’s it. Yung is actually correct when he says that the public’s information about the military comes from very controlled and restricted sources. This is by design. 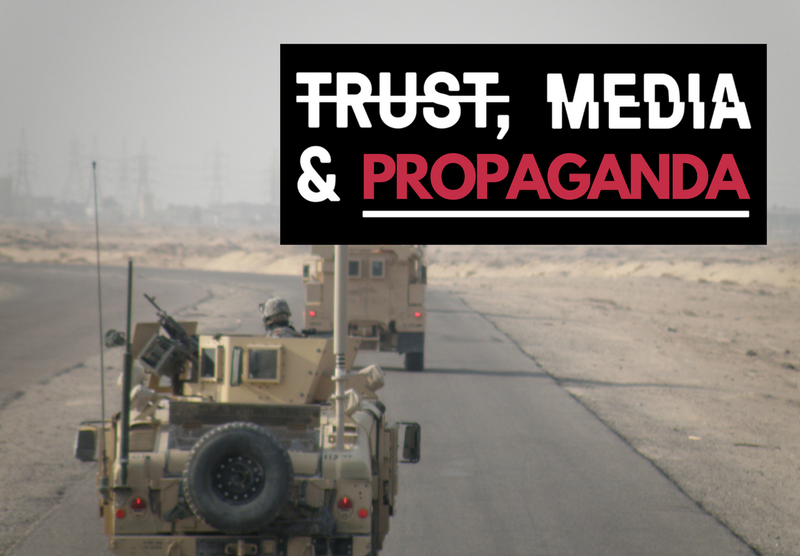 Embedded journalism provides a very distorted and one-sided perspective on war. Meanwhile, the Pentagon has made a concerted effort to insert itself and its interests into at least 900 different Hollywood productions since 2005. How (and why) the media should attempt to mimic these tactics — or how they might fund them — remains a mystery. I’m not going to get too deep into this one — it’s a silly argument on its face and I’m not even really sure what the implication is. Even if it were true that people in the military don’t brag, is the point here that journalists are notoriously braggadocios and need to tone it down if they want the public to like them again? I’m not entirely sure. But if you think people in the military don’t brag, you’ve obviously never met someone who just got back from basic training. There’s also the bit at the end of this section where Yung says veterans make “can do” neighbors who are “always with the chain saw ready to help chop up your fallen tree.” I honestly don’t know what this is supposed to mean, or what the media is supposed to do about it. Is he suggesting that journalists should put down their pens and pick up a weed-whacker, and then people will have more appreciation for journalism? Yung’s final argument for why the military represents the epitome of the American institution and is deserving of the public’s trust and admiration is that the military learns from its mistakes. The military, Yung argues, takes its failings very seriously and makes a conscious effort to avoid repeating them — or at least an effort to make sure people don’t remember them. Once again, Yung bends over backward to carefully describe the deep and systemic issues of sexual assault and harassment that run rampant through the ranks of the military. “There is no question that the military has a serious sexual harassment problem,” he writes. Yung claims that “Senior Department of Defense officials and the service chiefs” have taken steps to address the issue, but once again provides no sources or citations to support his claim. Regardless, whatever steps the military has taken certainly don’t seem to be working very well. He follows this up with a single sentence dedicated to acknowledging the decades of exclusion, ridicule, and abuse endured by homosexuals in the military. Starting with a warning from military psychiatrists in 1942 about “psychopathic personality disorders” that render homosexuals unfit to serve or fight, the military has a long history of degrading and scapegoating anyone who deviates from the accepted heteronormative standards for sexuality. Yung does commend the media for not shying away “from exposing the American public to these shortcomings.” But he does so by citing yet another IMDB page to support his statements, this time for a TV show from 1956 titled “Mister Roberts.” Yung doesn’t offer any solutions or recommendations for how the media might apply any of these lessons or tactics to improve the journalism industry or its relationship with the public. Yung’s readers are simply left to conclude that he must really want to make sure we’ve seen Mister Roberts. Which brings us to Yung’s final example for members of the media who wish to improve the public’s perception of and trust in journalism: the Vietnam War. New York Times columnist and Vietnam War veteran Karl Marlantes has aptly nicknamed the conflict, “The War That Killed Trust.” What lessons did the U.S. military learn in the wake of this illegal, aggressive, and ultimately unsuccessful war of choice? How did the military grow and change in the wake of the unfathomable human suffering and death that fundamentally damaged the U.S. presence and standing both at home and around the world? According to Yung, the military’s approach was three-pronged: (1) end the draft and move to an all-volunteer military; (2) do a better job of hiding your mistakes by producing better and more effective propaganda; and (3) keep telling the public that you’ve learned from your mistakes until they believe that you’ve learned from your mistakes. The military did move to an all-volunteer fighting force after the war, but there is absolutely no evidence whatsoever “that doing so vastly reduced, if not eliminated, poor and questionable behavior out in the field.” There is also no evidence in Yung’s sources that ending the draft eliminated a “whole host of psychological and personal problems from American service members which were apparent in Vietnam.” In fact, the word “psychological” does not even appear once in the source Yung cites to justify these claims. He’s either making it up whole-cloth, or he’s not showing his work. 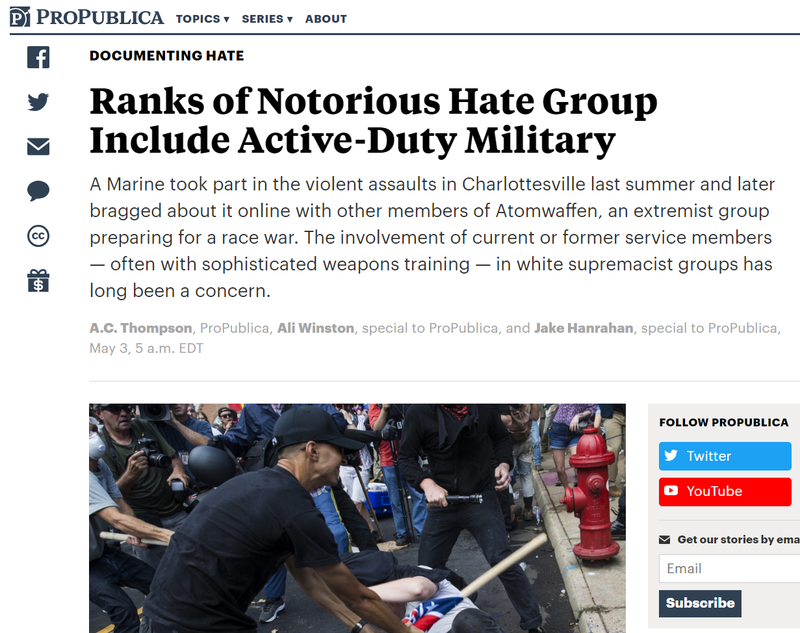 Screenshot: “Ranks of Notorious Hate Group Include Active-Duty Military” by A.C. Thompson, Ali Winston, and Jake Hanrahan for ProPublica.org. Second, the suggestion that the military’s ability to resurrect its public image via domestic propaganda and historical revisionism or erasure is not something that we should hold up as an example for other American institutions to emulate. That fact that this even needs to be explained here is, frankly, embarrassing. To paraphrase: The military earned a reputation for addressing its shortcomings by appearing to address its shortcomings, thereby giving it a reputation for addressing its shortcomings. From the fawning tone and servile language he uses, to the selective messaging and utter lack of substantive sourcing, to his objectively offensive erasure of the horrors of the Vietnam war, this really is one of the worst articles I’ve ever read. There’s just no getting around it. Yung’s article was ostensibly meant to be instructive for members of the media who wish to improve journalism’s standing in the eyes of the public. In reality, it’s nothing more than a thinly-veiled propaganda puff piece — and it’s not even good propaganda.